Breathtaking lakefront estate with Italian-influenced architecture sited on an elevated lakefront lot with towering Italian cypress, terraced waterfront views and all the character one would only expect to find in the hills of Tuscan wine country. 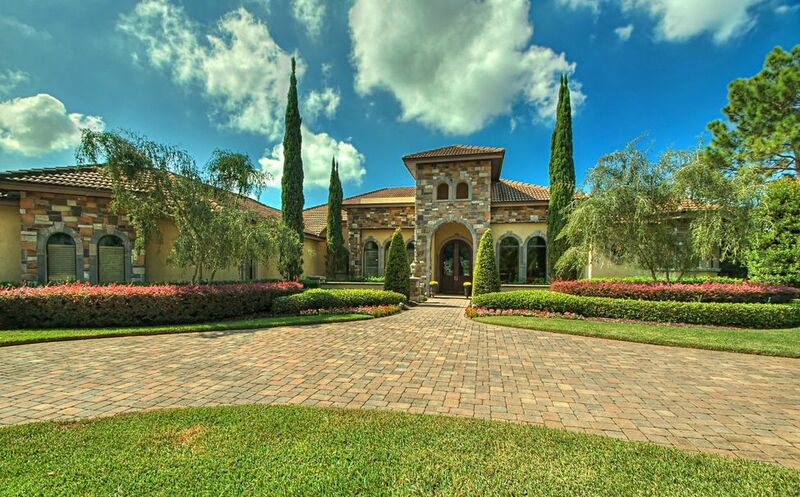 From the moment you step through the gracious entry you know this is a very special residence and it’s Tuscan elegance is found throughout the 4979 square feet of living space featuring 5 bedrooms, 4 full baths, 2 half baths and an executive office. The house has a spacious and well-designed orientation offering sweeping terraced lakefront views and captivating sunsets. Stunning professionally decorated interior with 14′-15′ formal living and dining room ceiling heights, exquisite hand-scraped hardwood and terracotta flooring, double-sided stone fireplace, detailed wrought iron accents, coffered wood beam ceilings, architectural columns and gorgeous imported lighting. The Italian family kitchen is the heart of this home with chef inspired appointments including rich granite countertops, hand glazed cabinetry, Frigidaire Pro Series stainless appliances and a butler’s pantry. Luxurious master suite with relaxing views out across the pool and lake, master bath chandelier lighting, granite countertops, soothing garden tub, tiled walk-in shower and large custom closets. Pool verandah and outdoor living area overlook the Italianesque landscape and glistening waterfront providing a place to call home for generations…SEE VIRTUAL TOUR FOR EXTENDED DESCRIPTION!! !